View of “Still, Flat, and Far,” 2010. Erin Shirreff has created a delicate balance between form and image for her exhibition “Still, Flat, and Far,” a literal title that is indicative of the structures she has arranged. Four sculptures made from compressed ash and Hydrocal, a white gypsum cement, lean against the walls and, in one case, jut up from the floor at an angle. The material composite gives these sculptures a sullen color and a surface that confirms fabrication. Adorning the walls, six photographs are presented in wooden frames like those in which butterfly collections might be displayed. These black-and-white newsprint images are fastened in place, one pin in each upper corner so the bottom edges curl, casting shadows. Such physical details typify the materiality imbued in Shirreff’s show. The images depict landscapes; the most potent captures two people squeezed on the extreme left of the photograph, the rest of the shot dominated by a monumental Tony Smith sculpture. Through her photography and sculpture, Shirreff investigates the material nature of these media and calls attention to how we read them. 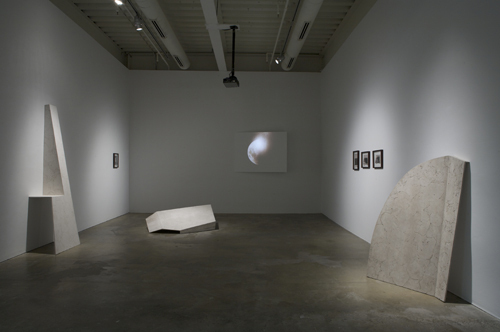 The connective tissue is Moon, 2010, a video in which an image of the moon is illuminated from various angles, highlighting the extreme readings one might make of a still image placed in variable lighting contexts. The thingness of this particular work is further emphasized by the screen on which it is projected. Like the linear planes of the sculptures, the screen protrudes from the wall, creating a triangle with the far right edge at the greatest distance from the wall. Thus, the projected image, in which lighting is the key to transformation, is also physically transformed by a compelling golden glow at the edge of the screen.